It’s full blown summer around here: school is out, it’s hot as heck, and I’m craving berry crisp. Making crisps and crumbles just screams summer, doesn’t it? Especially when you heap a huge scoop of ice cream on top! Friday was our first official day of summer vacation. It was also our first “whine and complain that I have to go to the gym with mommy day.” Why is going there such torture? It’s an hour out of the day, there are other kids, TV, toys, and you can read a book. Which is exactly what you’d do at home, except you’d be alone because there are no other kids here. Usually that speech works for one day. Then I have to give it again…and again. Thank goodness Jordan is old enough to stay home while I go to the gym, as long as her dad is here working (#iheartthatheworksfromhome). So this summer I only have to give the speech 10% of the time. Because I’m not giving up my workout time. I consider exercise my anti-depressant. It’s also essential when I make things like Berry Crisp just because it’s a Tuesday. And especially when said berry crisp has a crumble that tastes like an oatmeal cookie. This crumble is probably my favorite crumble topping EVER. I pink puffy heart crumble topping on pretty much everything. I don’t even know if I’ve ever made a two-crust pie – I always put crumble on top! Double crumble of course. Because single crumble is NEVER enough. 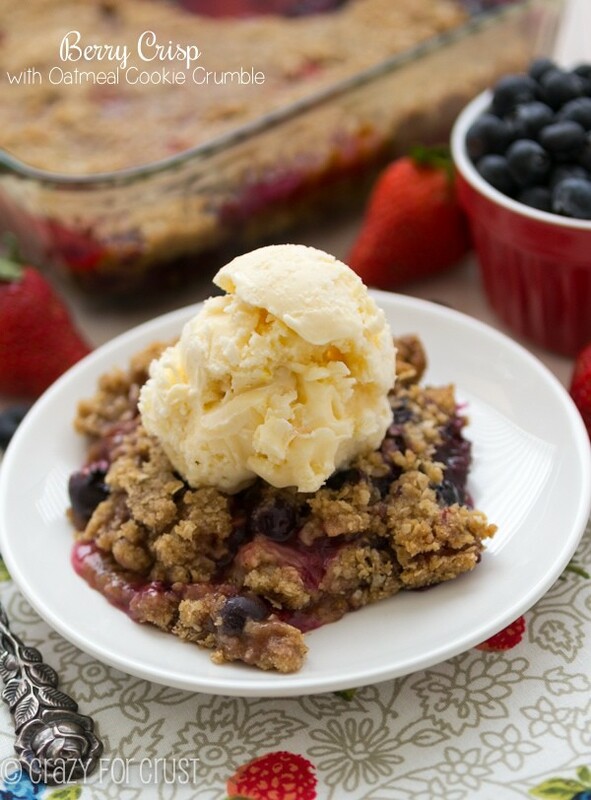 I decided to change up my normal crumble recipe for this Berry Crisp. I took the crumb from the Blueberry Crumb Pie I made last year and doctored it up just a bit. I took out the nuts to make room for lots of quick-cooking oats. Then I added cinnamon because every good oatmeal cookie has lots of cinnamon. The result? 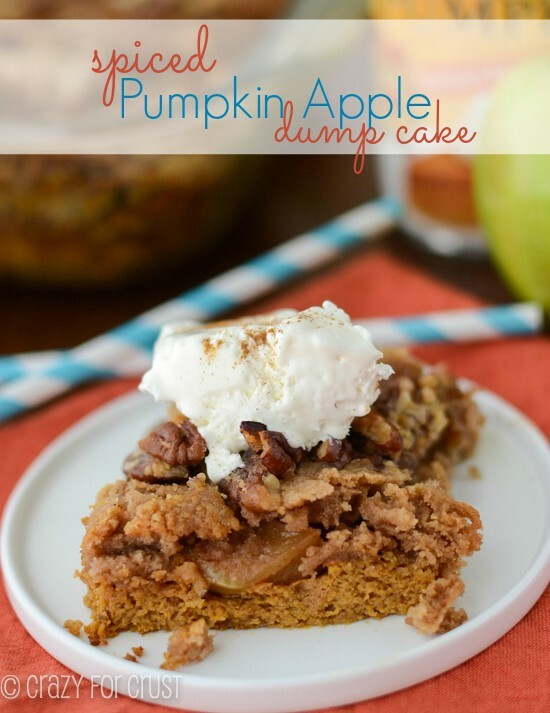 Crumble perfection that tastes like an oatmeal cookie! At first I was just going to make a strawberry crisp, but then at the last minute I spotted the blueberries in the refrigerator. I’m so glad that berries are coming back into season and (hopefully) the prices will go down. Since my husband started Whole 30 he’s been eating berries every day and my grocery bill has skyrocketed. Mixing up the berries in this crisp makes it easy to substitute your favorite berries, or whatever is on sale that week at the market. I used a pound of strawberries and a cup of blueberries. You want about 5 cups of fruit total, so mix and match as you please. And if fruit is still a gazillion dollars where you live, use frozen instead. It’ll wok just fine. I coated my berries with some lemon juice, flour, and sugar. It makes a nice thick juice during baking. That’s how I love my pies and crisps. 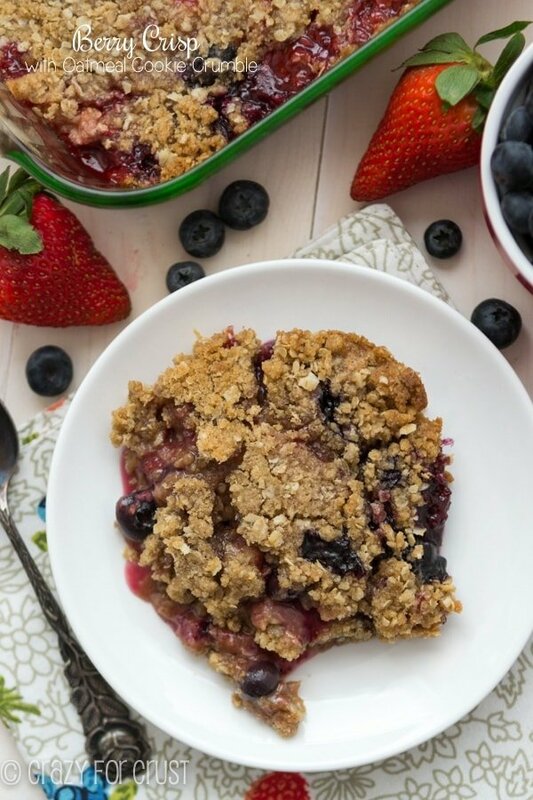 This is such an easy recipe because you just throw your coated berries in the bottom of an 8×8″ baking dish and then top it with the crumble. When you’re making the crumble, you want to start with cold butter. It doesn’t have to be super cold straight from the refrigerator, but it’ll become a gloppy mess if you try to use room temperature butter. I like to dice it into small cubes and add it to my dry ingredients with a pastry cutter. It takes work and muscles, but it makes a better crumb than using a food processor or mixer would. You may need to get in there with your hands to get all the butter incorporated. 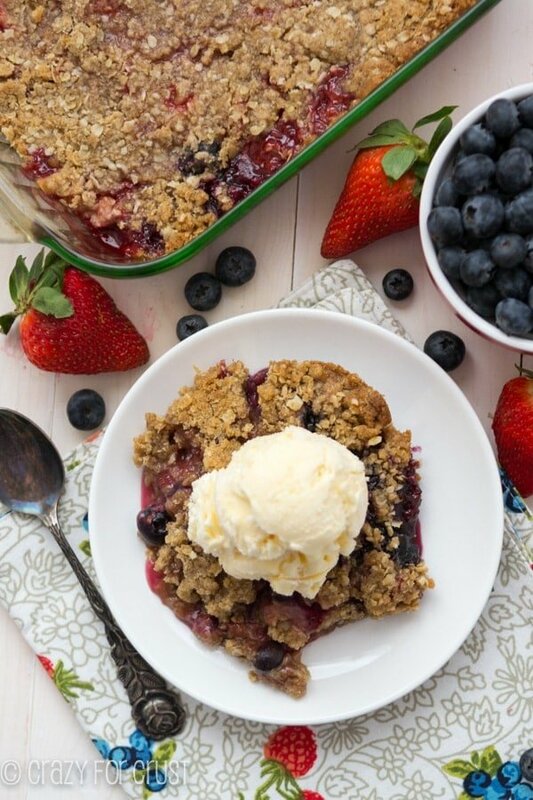 Once it’s baked it’s a crunchy, sweet oatmeal cookie-like crumble on top of sweet and juicy berries. This crumble is even better topped with a huge scoop of ice cream. It’s the perfect summer potluck dessert, 4th of July dessert, or just because it’s a random Monday and you want crumble and fruit. 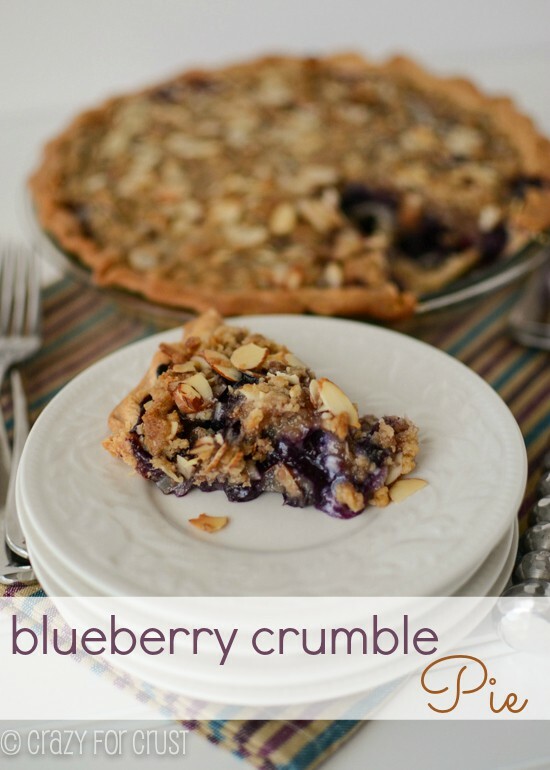 The topping on this Berry Crisp tastes just like an oatmeal cookie! Use your favorite berries to make a fabulous summer dessert. Make the crumble by combining the 3/4 cup flour, brown sugar, oats, cinnamon and salt in a large bowl. Use a pastry cutter to cut in the butter until the mixture forms small crumbs. You may need to use your hands to help it along. Set aside. Place strawberries and blueberries in a large bowl. Toss gently with sugar, lemon, and 3 tablespoons of flour. Place in the bottom of a 8” square pan. Pour the crumble over the top and press down slightly to compact. Bake for 30-33 minutes. It’s done when the crust is browned and the topping looks crunchy. Serve warm (or room temperature) with whipped or ice cream. Note: if you serve it before it cools and has time to gel, the filling will spill in the pan. Fruit crisp with a topping that tastes like cookies? Holy yum!!! I want this in my life immediately!!! 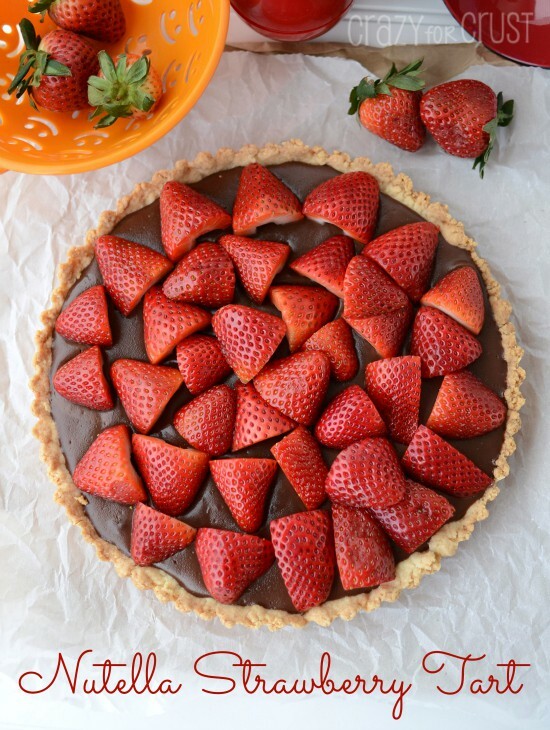 I have made this 3 times now….and added 1 1/2 cups of fresh pitted cherries in addition to the strawberries and blueberries. It is amazing!!! What a great addition! Thanks for letting me know. Cherries sound amazing in this! Would this work with apples by just substituting the same volume of fruit? Would the cook time change since apples are not as soft as berries? I meant to report back that it was delicious with the apples! You can make it ahead, I’m sure. I’d let it come to room temperature on the kitchen counter and then either microwave slices as you eat it or put the room temp pan in a 200°F oven while you’re having dinner to warm it up. So don’t refrigerate it overnight? Some recipes say to refrigerate a cobbler recipe . Thanks for your quick response. Look forward to making it Dorothy! Love this recipe! That is why we featured it in our list of the Best Dessert Recipes http://www.listsforall.com/best-dessert-recipes/. Would love if you would checkout the full list sometime. Keep up the good work! I love a lot of topping so I knew I would love this recipe. I changed the filling (this time; will try as listed another time) however because I had blackberries and rhubarb (no strawberries) on hand and I knew it would need more sugar with the rhubarb. So I found another recipe for the fruit part and used this topping. The topping is soooooooo goooooood. I’m so glad you liked the topping! 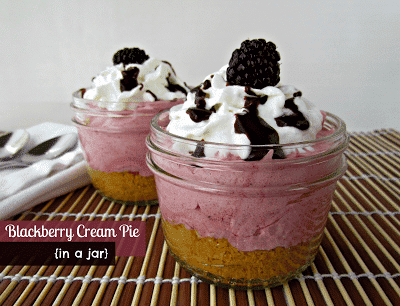 It’s great with any fruit combo – the blackberries and rhubarb sound good! Hi Dorothy! I was hoping to do the exact same thing as Carrie did and add in rhubarb along with my strawberries and raspberries but she made a very good point regarding the extra sugar that would be required. I am still hoping to use your full recipe because it looks fantastic rather than combining two recipes – are you able to advise how much additional sugar and any other ingredients would be required if I were to add in rhubarb? In addition, (maybe Carrie is able to answer this one as well) how much of the 5 cups of berries total should rhubarb occupy if I added it? Your help would greatly appreciated! I’ve never cooked with rhubarb before, so I’m not sure how much sugar needs to be added. But I found a recipe on Taste of Home that called for 3 cups of rhubarb and 2 cups of strawberries and 3/4 cup granulated sugar. I hope that helps! this didn’t work at all. the “crisp” oatmeal topping wasn’t crunchy. i even put it under the broiler for a few minutes. i thought the dry ingredients should have been incorporated in a stand mixer with a paddle – which is how i work a pastry dough, but i decided to do it by hand. i think this was probably where things went wrong. how many cups of berries is 1 lb? With this recipe I usually use about 5 cups of berries.